Frank J. Oteri, the American composer and music journalist once observed that music and painting seem to have very little in common. They appeal to different senses for one thing, and whereas a painting exists in a physical space, music exists in time. I suppose you can give a painting a quick glance and presumably the more it interests you, the longer you’ll want to look at it. But if a musical work lasts half an hour, you’ll need to invest half an hour of your time to hear it. We could go into philosophical detail at this point, but it’s the weekend and you might be feeling as jaded as I am. So if you don’t mind too much, we’ll leave the philosophy for another occasion. Even so, paintings and music have one singular thing in common in that they can both express emotions and ideas when words seem to fail. The idea that a painting can inspire music is a fairly recent concept in historical terms. It probably appeared sometime during the early part of the nineteenth century as the Romantic Movement began to emerge. Respighi’s Trittico Botticelliano was inspired not surprisingly, by paintings of Botticelli. The Czech composer Bohuslav Martinù wrote a delightful orchestral work called The Frescoes of Piero della Francesca. When Gian Carlo Menotti was commissioned to write an opera for television, he found inspiration from a picture in the Metropolitan Museum of Art in New York, The Adoration of the Magi by Hieronymus Bosch. The result was the famous opera, Amahl and the Night Visitors. William Hogarth’s picture, A Rake’s Progress inspired a short opera by Stravinsky and some of Blake’s paintings were the starting point for the 1931 ballet Job by Ralph Vaughan Williams. But perhaps the most famous of all these works is a suite by the Russian composer Modest Mussorgsky which took its inspiration not from a large imposing canvas, but from a selection of comparatively small drawings and water-colours by the composer’s friend, Viktor Hartmann. Dating from 1874, this work was originally a suite of ten movements for piano. Viktor Hartmann was an artist and architect who had died the previous year aged only thirty-nine. He was well-known and his early death shocked Russia’s art world. 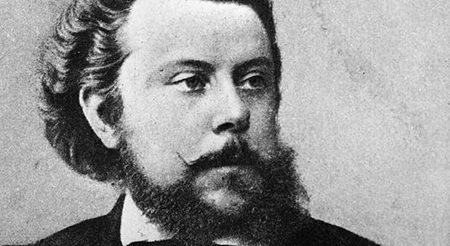 An exhibition of four hundred of his pictures was organised in St. Petersburg and this event inspired Mussorgsky to write Pictures at an Exhibition which he completed in only six weeks. Each of the movements takes its idea from one of Hartmann’s illustrations and there’s a recurring and varied main theme which symbolizes the observer wandering through the exhibition. The work has become best-known through the many orchestrations produced by other composers and arrangers. The best-known remains the brilliant orchestration by Maurice Ravel. The work still has the ability to startle and has passages which must have sounded strikingly modern at the time. This splendid performance is given by an orchestra of students between the ages of sixteen and nineteen and who are some of the most talented teenage musicians in the USA. It was recorded at Carnegie Hall, New York and the final movement, The Great Gate of Kiev, is thrilling. Rachmaninoff first saw Arnold Böcklin’s haunting painting, Isle of the Dead when he was in Paris in 1907. The music starts with quiet, indistinct but ominous sounds on the low strings, harp and timpani suggesting the sound of Charon’s oars as they plunge into the dark waters. In case you’d forgotten or perhaps never knew, Charon is the ferryman of Hades who carries the souls of the deceased across the rivers Styx and Acheron, which divide the world of the living from the world of the dead. This is a powerful, dramatic work but after the lugubrious opening section, the musical texture lightens and at 06:42 the there’s a sense of increasing energy leading to a shattering climax at 13:54. Gradually the intensity relaxes again and the music takes us back to that quiet and gloomy place where our journey began. Böcklin was a Swiss symbolist painter who actually made five versions of his strange painting. Many of his pictures depict a bizarre and dark fantasy world and sometimes portray curious figures invariably set against classical architecture. He seems to have been overtly obsessed with violence, death and destruction. Interestingly, Adolf Hitler was an admirer of his work and apparently owned eleven of his paintings. It would have been immensely satisfying to tell you that Böcklin ended his life in an institution for the criminally insane. But he didn’t.